Thank you for receiving me and giving me the opportunity to be here with you and to share this time in your lives. It is a difficult time, one full of struggles. I know it is a painful time not only for you, but also for your families and for all of society. Any society, any family, which cannot share or take seriously the pain of its children, and views that pain as something normal or to be expected, is a society “condemned” to remain a hostage to itself, prey to the very things which cause that pain. Life is a journey, along different roads, different paths, which leave their mark on us. We know in faith that Jesus seeks us out. He wants to heal our wounds, to soothe our feet which hurt from travelling alone, to wash each of us clean of the dust from our journey. He doesn’t ask us where we have been, he doesn’t question us what about we have done. Rather, he tells us: “Unless I wash your feet, you have no share with me” (Jn 13:8). Unless I wash your feet, I will not be able to give you the life which the Father always dreamed of, the life for which he created you. Jesus comes to meet us, so that he can restore our dignity as children of God. He wants to help us to set out again, to resume our journey, to recover our hope, to restore our faith and trust. He wants us to keep walking along the paths of life, to realize that we have a mission, and that confinement is not the same thing as exclusion. Life means “getting our feet dirty” from the dust-filled roads of life and history. All of us need to be cleansed, to be washed. All of us are being sought out by the Teacher, who wants to help us resume our journey. The Lord goes in search of us; to all of us he stretches out a helping hand. Jesus invites us to share in his lot, his way of living and acting. He teaches us to see the world through his eyes. Eyes which are not scandalized by the dust picked up along the way, but want to cleanse, heal and restore. 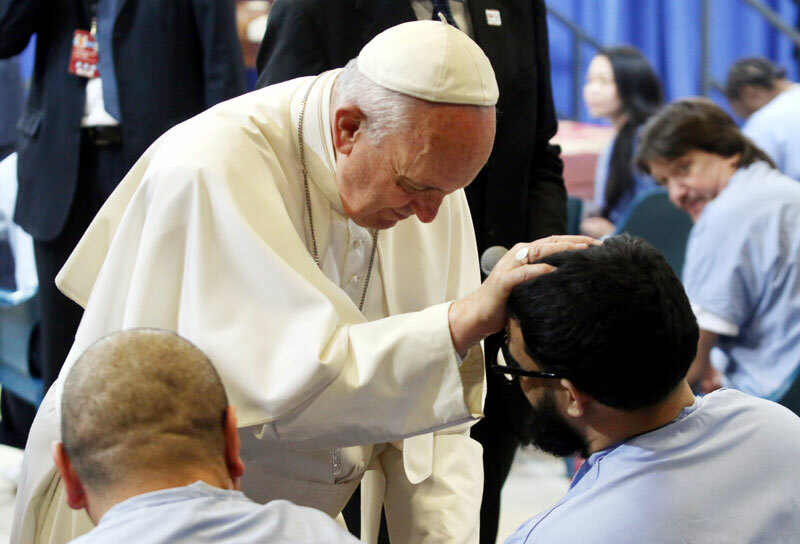 He asks us to create new opportunities: for inmates, for their families, for correctional authorities, and for society as a whole. I encourage you to have this attitude with one another and with all those who in any way are part of this institution. May you make possible new opportunities, new journeys, new paths. All of us have something we need to be cleansed of, or purified from. May the knowledge of that fact inspire us to live in solidarity, to support one another and seek the best for others. Let us look to Jesus, who washes our feet. He is “the way, and the truth, and the life”. He comes to save us from the lie that says no one can change. He helps us to journey along the paths of life and fulfillment. May the power of his love and his resurrection always be a path leading you to new life. Thanks for publishing the homilies and speeeches of the Pope during his visit. I am making an album with the pictures I took on my TV but I am also collecting your work such as the extraordinary pictures and explanations (Gettysburg lectern, plaques and Washington statue at Independence Hall). I have an album for the Saint John Paul II’s Mass at Logan Circle, but this time I have pictures and commentaries sent to me from Cuba. I’ve had seven friends and family calls regarding Pope Francis and how much joy they felt. It was a unifier – everybody was watching TV and talking about it. So thanks again for providing this service. I could not have remembered what Pope Francis said but now I can read about it thanks to you.